AllianceTek has the right experience and unmatched expertise in Web Servers Hosting, Mail Servers Hosting, SharePoint Systems Hosting and Custom ERPs Hosting. AllianceTek has provided a range of clients with end-to-end services from requirement gathering and development to deployment, hosting and support. We have worked on several industry-specific applications and have years of experience deploying on web, mobile and software applications. Our hosting services include shared as well as dedicated hosting of various web applications built on diverse platforms like PHP and .NET. Why AllianceTek for Hosting Services? AllianceTek also has experience in hosting web applications on giants like AWS and Azure. We also offer advanced levels of hosting that provide replication of virtual private servers (VPS). For VPS we provide IAAS and SAAS based support. Security of your data is important to us. We take all measures to prevent any infiltration into our servers. We perform regular server updates and apply security patches as and when there is a new update. We also take regular backups to safeguard your data. 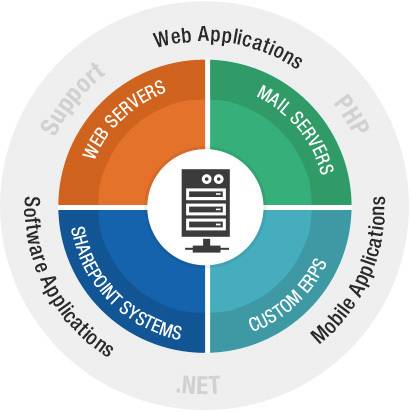 We have hosted several applications, including SharePoint Systems Hosting, and have continued to provide reliable, cost-effective, and secure deployment and ERP Hosting Solutions. Call us at 484-892-5713 today and discover more about how our Hosting Services can enhance the performance and dependability to your system. We’ll help you plan the best course of action to meet your specific business needs.